We have all witnessed media reports of the aftermath of mass victim attacks. We see the carnage, and we know that attackers do not show mercy. Victims were innocent and were targeted simply for being a part of a small or large group of people. Whether a bomb, semi-automatic weapon, knife, or vehicle, the attacker strikes quickly and without mercy. Victims may have been dining in a restaurant, relaxing at a bar, participating in school classes, attending a workplace activity, or simply walking on the street. Because of the horrific and effective nature of such attacks, we are often left fearing that little to nothing can be done if the unthinkable happens, and we are caught in such a merciless attack. Surviving Mass Victim Attacks presents specific and valuable strategies for survival if the unthinkable happens, and serves as a practical guide to anyone who wishes to be more knowledgeable and better prepared if caught in an attack themselves. 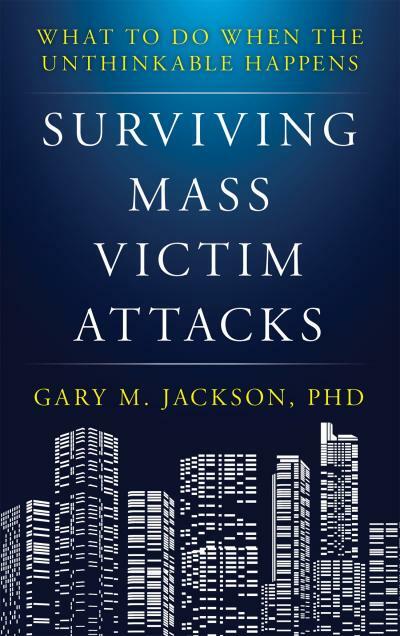 Gary Jackson is a behavioral psychologist threat expert with operational experience who analyzes how victims have managed to survive past mass victim attacks committed by international terrorists, domestic terrorists, self-radicalized terrorists, those with mental health issues, and those driven by hate and bias to present strategies that anyone can use to increase their chances of survival if the unthinkable happen. Throughout, different types of mass victim attackers, their methods, how and what they target, and how to use characteristics of the location to increase survival are addressed. The book uses real life examples to illustrate survival; the strategies presented are easily understood and do not require special skills to execute. By reading Surviving Mass Victim Attacks, you will be better able to know what to expect, how to prepare proactively, and how to respond in a way that will save your life.